Hundreds of thousands of people walk the pilgrim route of the Camino de Santiago each year seeking physical challenge and spiritual renewal. 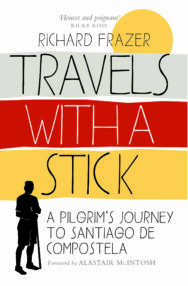 Church of Scotland minister, Richard Frazer, has made the journey and written about the experience in Travels With a Stick. Here we have an extract where he ponders on Scottish pilgrim routes and the nature of friendship. Pilgrim routes lead us to places with wonderful stories to share. The Rev. Alexander John Forsyth, parish minister of Belhelvie in Aberdeenshire in the early nineteenth century, was a keen field sportsman but was unhappy with the firing mechanism of his rifle. He had to fill it with gunpowder that invariably got damp, so he invented the first percussion mechanism to be used in a firearm and had great fun trying to sell his idea to the British Army. When they dropped the idea, he is supposed to have tried to negotiate with Napoleon Bonaparte. His would be a great story to tell on a pilgrimage route through the North-east, putting Belhelvie on the map. The parish of Fortingall in Perthshire has one of the oldest trees in Europe and is reputed to be the birthplace of Pontius Pilate. The parish of Luss on Loch Lomondside, where the Celtic evangelist St Kessog did so much to spread the Gospel and then was executed by Druids, is a beautiful spot and already has a ‘Pilgrim Palace’, constructed from surplus Royal Navy portacabins. I can’t help but think that there is a real opportunity for congregations all over Scotland to revive their sometimes flagging spirits by sharing their amazing stories about faith and the rich cultural narrative of their nation. I found myself reflecting on the people I had met along the route, and my thoughts turned to a newspaper article I had read recently, written by the Edinburgh author Alexander McCall Smith, in which he had explored the nature of friendship. I have always liked him as a writer and have admired his desire to see the good in people. I have a couple of reasons to be grateful to him personally too. But on the Camino I found that our views on friendship were beginning to differ. The article had a very ‘Edinburgh’ take on the whole concept. He suggested that it might take years to establish a real friendship and that before being in a position properly to invest in a friendship one had to go through many preliminaries. I have to say that on the Camino I was meeting people that I could quite confidently call friends, even if our acquaintance only lasted a matter of hours. I have often felt that when I meet someone, I can, very frequently, tell if this is someone whom I would like to get to know within an instant. Friendships, I think, don’t always have to be tried and tested or last a lifetime. They can spontaneously arise, and then you move on, but you are the richer for having been open enough, made yourself vulnerable enough and been frank enough to have made a connection, an exchange of humanity. Indeed, I think that one of the things that our settled urban life often prevents us from doing is really engaging with our neighbours. 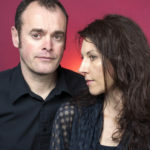 We fear that if we disclose too much we might be put into an awkward situation, and, having given too much of ourselves away the other person might have something ‘on us’ to use against us in the future, so we hold back. The freedom and trust of the Camino allows real friendship to arise and develop very quickly and can be a genuine source of blessing, even if it does not last longer than a few miles or a pilgrim dinner. There is a biblical imperative to be open to the blessing of the empty-handed stranger, the unknown one who just might be Christ in disguise. Just think of the disciples on the road to Emmaus (Luke 24) and how, when they broke bread with a perfect stranger and offered hospitality in open friendship, their hearts burned within them as they felt they had met their friend Jesus whom they’d seen die on the Cross just days before. There is an old Celtic rune of hospitality I love, which concludes, ‘Often, often, often, comes Christ in the stranger’s guise.’ And, of course, the writer of the Epistle to the Hebrews invites his readers to make hospitality to strangers a special care, for ‘thereby some have entertained angels unawares’ (Hebrews 13:2).